Did you know that you can make and apply your own extensions by using a glue gun? Although it has so many different uses, a glue gun can actually be used for extensions as well. If you’re a fan of the fusion method, you can install your nail / u tip hair extensions like a true professional with our hot glue gun. But that’s not all, you can also make pre-bonded and other types of extensions. 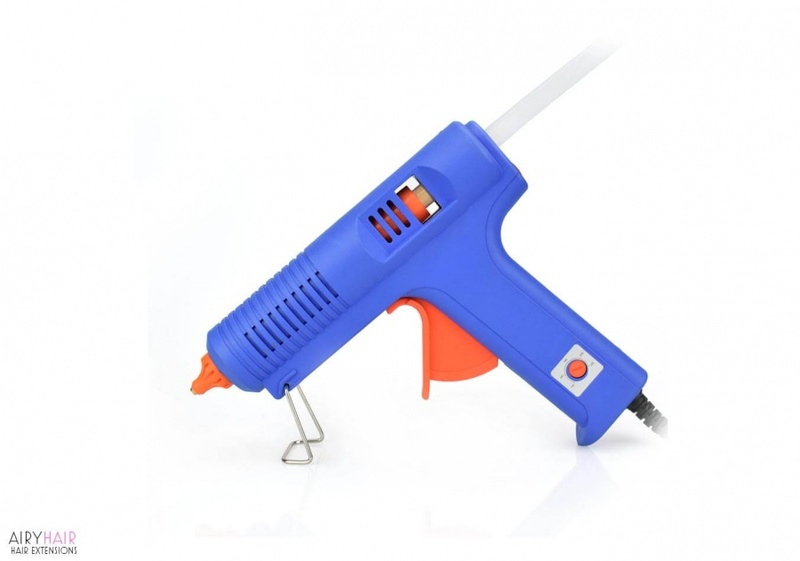 Depending on your needs, you can choose from a 15W and a 45W glue gun. Both work very well. The color is a great combination of blue and orange that create a nice contrast. The gun is made from a high-quality plastic material that will last for a long time. The design is very functional and the gun fits perfectly in your hand. The trigger is very precise and you can control how much glue comes out by pressing it more or less. Applying and reapplying the glue sticks is very easy and takes only a couple of seconds. Using the gun is very straightforward and you will find that it’s a very useful tool to have around, whether you’re using it for extensions or something else. 1. Unpack your glue gun. Take a glue stick and place it in the gun. You will see a circular opening at the back of the gun and that’s where you should put the glue stick. 2. The next step is to plug it in. Once you do that, it will start to heat up around the tip area so be careful not to touch it with your fingers when it’s hot. A neat feature of this gun is that you can adjust the heat. On the handle, you will see an orange wheel that you can turn clockwise and anticlockwise, depending on how hot you want the gun to be. 3. Once you are ready to use it, you simply need to push the trigger down very slightly and that will push the glue through the gun and once it gets to the tip, it will melt. You don’t want to push too hard at first because too much of the glue will come out. 4. When you’re using the gun, make sure that you’re very careful. Avoid touching the glue or it melting all over your clothes. Also, it’s a good idea to protect the surface you’re working on it order not to damage it. 5. A useful feature our glue gun has is a small metal stand. When you’re using it, you can simply put it down and it will be held by the stand. 6. When you’re putting glue on your extensions, make sure that you don’t get any on the hair itself. You should add glue only to the tips. It’s a good idea to get a friend to help you while you’re doing it. I/U tip extensions are used for the fusion method which is very popular strand by strand option. I and U tips got their name because of the shape of the glue that is on the hair and both options are great. Although glue is used, it is much different than the tape in method. The pre-bonded tips are placed on the strands of your hair and fused together using a hot wand that heats up the glue. Using a glue gun, you can make pre-bonded fusion extensions which means you would apply the glue on the strands and leave to dry. After that you can use the extensions like you would regular I/U tips and apply the fusion method. Another thing you can do with a glue gun is actually apply the I/U tips. We’re going to show you how to do both. Keep in mind that it’s best to use keratin and not regular glue. Keratin is a protein derivative from human hair so it is absolutely safe to use. So you can buy glue sticks for your gun that are keratin based. You will need only hair and a glue gun to do this. Prepare your gun by loading the keratin sticks. Take one strand of hair and apply the glue on the very tip. Wait for the keratin to dry, which should be pretty quick. Repeat this process for all the strands. Keep in mind that you need about a 100 for a full head of hair. Now you have pre-bonded extensions that you can easily apply with the fusion method. Making pre-bonded extension and then applying them can be a very long process, although you can do it if you want. But it is actually easier and quicker to use a glue gun to install the hair. The way you do it is similar to making pre-bonded hair. You need to select one strand and apply a bit of keratin glue using your glue gun. For even distribution, squeeze the glue onto the center and then work it around the entire tip. Now it’s time to apply it to your or your client’s hair. Always place the extension bellow the real hair. This helps to blend it most naturally. Once the extension is positioned correctly, apply pressure with your fingers to ensure even distribution of glue. Roll the hair with your fingers until a strong bond is created. Also try to taper the ends of the glue as your roll. Remember to apply the extension about a quarter inch away from the scalp. Keeping it from touching the scalp allows the natural hair to grow and keep its movement. And that’s how you use a glue gun with extensions - it’s pretty easy and quick and it’s the perfect tool to have around.